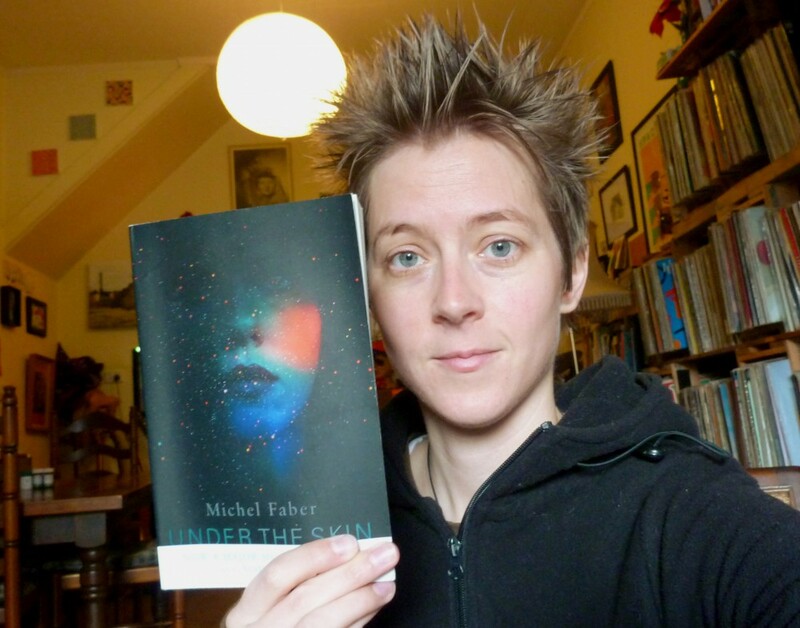 Michel Faber’s Under the Skin is a story about Isserley, an alien woman whose job involves picking up muscular, stray, male hitchhikers and bringing them back to the farm to be processed as a delicacy meat for the rich back on her home planet. Her life and job (which is her life) is physically demanding, tiring and lonely, yet she is able to convince herself that she’s doing the right thing by imagining the alternative life she would have had back home, and by taking pride in the fact that she out of anyone can perform this difficult task. Things change when the the rich, famous son of her boss comes to visit the farm. The story is set in the highlands of Scotland during the bleakness of winter, and the adjectives “cold”, “desolate” and “beautiful” could describe not only the setting but also the book as a whole. Although Isserley is not of our species, and is everyday purposefully seeking suitable humans (or “vodsels” in her language) to place in horrific conditions to be eventually processed as food, you can’t help relate to and sympathise with her. Her loneliness is profound, as is her self-loathing and confused sense of identity. She has been mutilated to look like the very dumb animals she is capturing, an irreversible surgery that has left her unable to express herself naturally, or even sleep in a proper, respectable way (curled up on the floor, snuggled into her tail – not lying on a mattress, tangled in old linen like a dirty animal). Isserley has learned the language of humans, and has learned to imitate their customs and behaviour, but she does not understand humans, nor even try to. She relates much more to four legged animals – sheep and cows – entirely due, it seems, to how similar they look to her own species. Speciesism – a word not often used in our everyday language, meaning when one believes that a particular species has more or less value than another – is a clear theme of the novel. I believe that Faber draws an analogy to how we treat our own animals. We generally hold ourselves as superior, we often don’t take the time to properly understand other species (except on a superficial level), and, obviously, we factory farm animals just as the aliens are factory farming humans in the book. In fact, Faber has chosen very similar factory farming methods to what we use: the “vodsels” are neutered, kept in small, dark pens, and are fattened unnaturally over a very short period, before being killed, cut up and packaged in plastic. I have often heard people say that humans won’t start treating other species better until we first start treating our own species better. We create weapons and start wars. We torture. We take peoples’ land. We expect people to work long hours for little pay. We create unfair disadvantages for people then stick them in prison when they do something wrong. We let people starve. On Isserley’s planet, the air is so polluted that the majority of people live in vast underground estates, with only the rich living in lavish, sealed complexes on the surface. In the estates, the poor are forced to work terrible jobs in horrific conditions, with no hope of escape, and no prospects other than slowly failing health. At the same time that Isserley hates the rich with a passion, she despises the “estate trash” workers that man the farm. She doesn’t see the contradiction. Faber is a brilliant writer. He dishes out the information bit by bit, filling in the greater picture slowly as the story unfurls. I’ve since picked up a copy of The Fahrenheit Twins, a collection of his short stories. I’ve read two of them already and enjoyed them. I get the sneaking feeling that I’ll read all of his work, eventually. Great review, Immi. I really like Michel Faber’s work. Makes me want to read ‘Under the Skin’ again.